Hi pretty things! Today I’ll be showing you my bullet journal supplies that I have bought specifically for bullet journalling for the past month. I am quite happy with my supplies right now although I could use more brush pens in assorted colours #addicted. 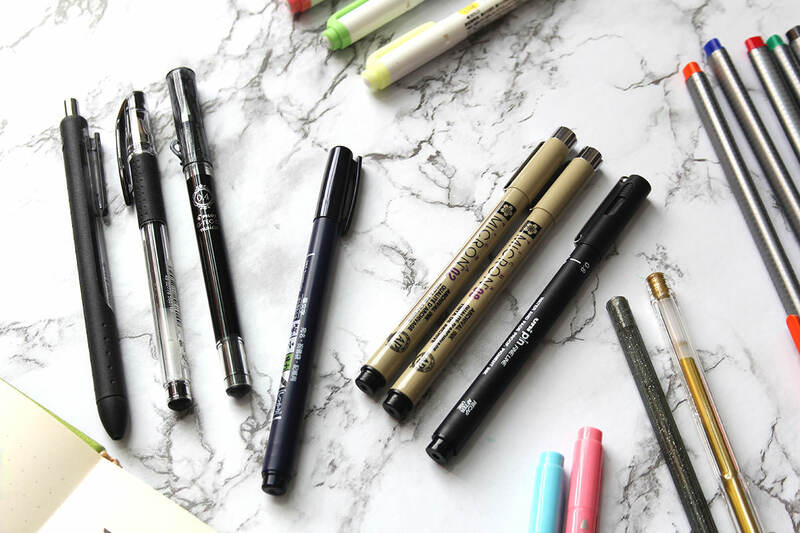 I must say that I am still a novice in bullet journalling but it is not a hard concept to grasp so with a little bit of studies on YouTube (read: bullet journal videos), you can create a suitable bullet journal system that suits your needs. The most important thing for bullet journalling is of course, the notebook. You can use whatever notebook you have or you can use the one with dotted pages like I do (and the rest of the bullet journal community do lol). The notebook I’m using is the Unicorn Giornale notebook in pointed pages. I think Unicorn is a Malaysian brand so it’s not very hard to get here. You can get it at Borders or AEON or online stores like Lazada and Shopee. The price is very cheap too at RM21.60 so if you decided that bullet journalling is not for you, then you won’t feel that bad for spending money on a cheap notebook. These are the pens that I use for writing in my bullet journal. The first one is Pilot G Tec-C Maica in 0.4mm. I love this pen so so much! I think it’s a great pen for writing and it’s very smooth too. The next one is Uni-ball Signo DX in 0.38mm as per recommendation by Amanda Rach Lee. I like this one too but I prefer the Pilot one more. The third pen is PaperMate InkJoy in 0.5mm. This is a great pen but it takes some time to dry and being a lefty that I am, I am always left with dirty knuckles and a smudged page. Not cute. My favourite and also the only brush pen I have, the Tombow Fudenosuke Brush pen in hard tip. This is what I use for cursive writing and calligraphy. I’m still getting the hang of it though but it’s what I reach most when I want to make a simple header. 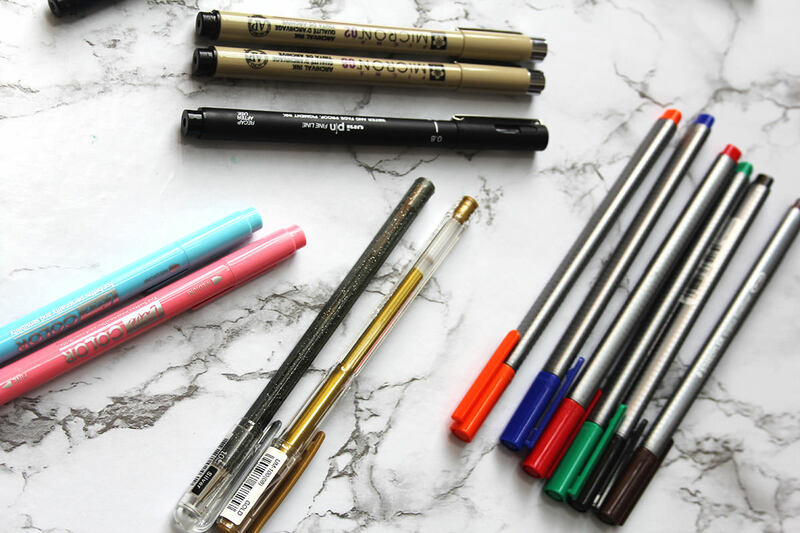 Fineliners are probably what I have the most as it’s the most crucial for the drawings and structures of your bullet journal. I have the Sakura Pigma Micron in 0.3mm and 0.5mm. These are my favourite just because they are so pretty and I’m scared of ruining the tip if I use it excessively. I also got the Uni Pin Fine Line in 0.8mm. I figured I need a thicker fineliner just in case. But my most used fineliners are the set of 6 Staedtler Triplus fineliner in 0.3mm especially the black one. I use it for everything and I will definitely repurchase a couple of it as backup. I use these for a little decoration here and there. I haven’t gotten a good use out of these metallic pens but it’s good to know that I have them in handy. They are the Uni-ball Signo Metallic in 0.8mm gold and Pentel Hybrid Dual Metallic in 1.0mm silver. Marker pens were not in my list of supplies to buy but I saw these Monami New Live Color in baby pink in sky blue which have dual ended tips, one end with medium tip and the other with fine tip. They are such soft colours that act as accent colours for my journal. 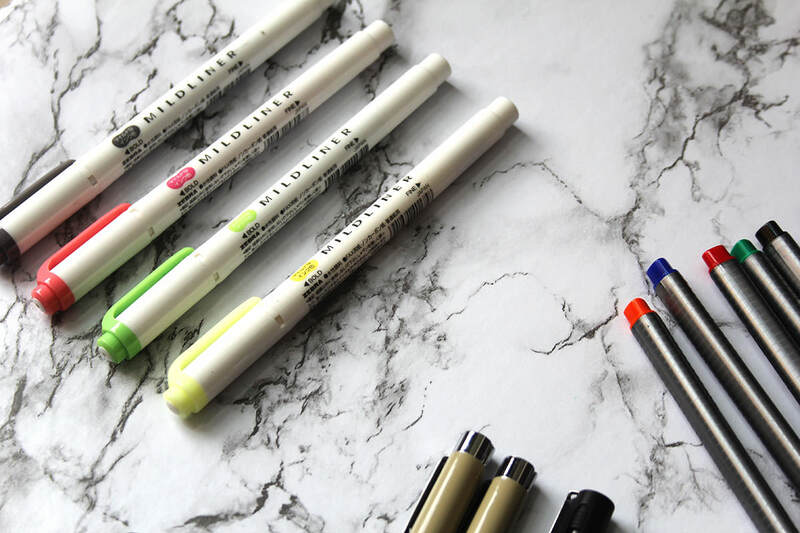 These Zebra Mildliner is probably a must-have for every bullet journallers and I can understand why. They’re pretty and the colours are not as vibrant as the ones we all used for highlighting back in high school. I bought them individually but I saw the packs of 5 at the bookstore I always do my shopping and I might get them soon. Aside from pens, I also got some glue stick, a steel bookmark ruler, and a pencil case to keep my supplies. I wanted to buy a glue tape so bad but I had to calm myself down, take a deep breath and reevaluate my life’s decision. LOL. Here’s the pen test page at the back of my journal just so you can see the pens in action. Thanks for reading this post! I hope you enjoyed reading it as much as I enjoyed writing it. Do you have a bullet journal? Do you want to have one?